Mini Chopper Project For My Grandson! 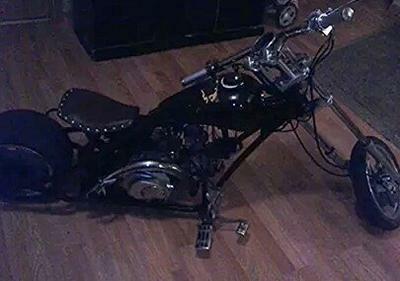 Almost three months and one bent axel, several stripet threads and broken bolts, this mini chopper came out like this. The seat height is 19 inches whellbase around 6 to 6.5 feet. My grandson bought this mini chopper for 150 bucks. He asked me if i could maybe re-do it first he wanted to change the fuel tank put forward controls on his 6ft 2, maybe paint it if i had time. When i started first thing dismantel it to the frame it had no brakes on the back. I located and bartered for a mechanical caliber, made a mount, made the cable to connect to the new forwared control that I had. Next, relocate the battery box to open the frame, rewired to get rid of all the wires that were hanging all over it. I then made a front fender and mount same with the rear fender next replaced the plastic headlight with a 250 Ducati parts bike I had. It now has a round 4 car low beam headlight. I repaired several broken striped bolts, changed the gearing on the counter sprocket and jackshaft, and painted both wheels and the frame as well. I lowered the seat to 19 inches from the ground and took the exhaust pipe off and replaced it with a side muffler. It sounds much better. 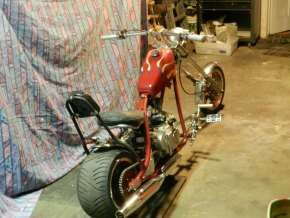 I made a sissy bar, the tank is a small sportster type tank which I painted it with flams to match my 1969 BSA chopper. It took almost three months to do. It took about as long as my BSA. It was an interesting project since I'm retired. It kept me busey for a while. I hope the people like it as much as my grandson. Thanks. Comments for Mini Chopper Project For My Grandson! But I think you have the before and after pictures mixed up. I'd would have like to be a fly on the wall when your Grandson came to pick it up. Great job. Join in and write your own page! It's easy to do. How? Simply click here to return to Mini Choppers.